Since Cameron Mackintosh first conceived this new production of Les Misérables in 2009 to celebrate the show’s 25th anniversary it has taken the world by storm and was hailed a huge success by audiences and critics alike. Now this UK and Ireland tour, embraced by modern audiences across the globe as a Les Mis for the 21st century, is set to sell out in many places before it opens. The Curve Leicester run sold out in record-breaking time, with last remaining seats in Dublin, Edinburgh and Manchester. This production inspired the hugely successful movie version starring Hugh Jackman, Anne Hathaway and Eddie Redmayne.The brilliant new staging has scenery inspired by the paintings of Victor Hugo, and has to date already been seen in North America, Brazil, Mexico, Korea, Japan, Canada, Australia, Spain, France, Manila, Singapore, Dubai and on Broadway. 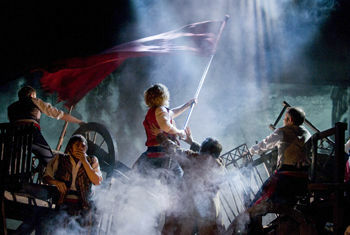 Cameron Mackintosh’s production of Les Misérables is written by Alain Boublil and Claude-Michel Schönberg and is based on the novel by Victor Hugo. It has music by Claude-Michel Schönberg, lyrics by Herbert Kretzmer and original French text by Alain Boublil and Jean-Marc Natel, additional material by James Fenton and original adaptation by Trevor Nunn and John Caird. The original Les Misérables orchestrations are by John Cameron with new orchestrations by Christopher Jahnke, Stephen Metcalfe and Stephen Brooker. The production is directed by Laurence Connor and James Powell, designed by Matt Kinley inspired by the paintings of Victor Hugo with costumes by Andreane Neofitou and Christine Rowland, lighting by Paule Constable, sound by Mick Potter, musical staging by Michael Ashcroft and Geoffrey Garratt, projections by Fifty-Nine Productions and music supervision by Stephen Brooker and Graham Hurman. The London Production of Les Misérables continues to play at the Queen’s Theatre where it is currently booking until 29 June 2019. Priority on sale for Bradford Theatres Friends from 9am on Friday 23 November. Bradford Friends memberships are available to buy from £15 from the Box Office or at bradford-theatres.co.uk. Tickets go on general sale on Friday 30 November 8am in person or 10am phone/online.